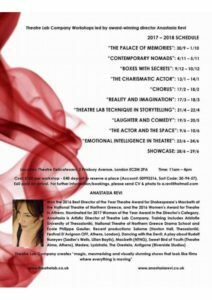 The new Theatre Lab Method Workshop schedule will consist of 10 workshops over a year where I will teach technique, language, storytelling, dimensions of voice and body and finally the magic of Theatre Lab. The programme will end with a Theatre Lab Showcase on 28th and 29t h June where you will be able to perform and present the Year 1 work completed. To participate in the showcase, a minimum 8 of the 10 workshops must be attended. Those who participate in less than 8 workshops can still enjoy the process but not participate in the showcase. TLC will officially support the showcase, it will be publicised as such, and you will be able to show your work to larger audiences including friends, fellow artists and industry people. Please see the flyer for further information and workshop dates. Each workshop is a different chapter of a very exciting book, the book of Theatre Lab Company. I can send a short description for each workshop, but for the moment this is the timetable with dates, time, venue and cost. Whether you choose to participate in all or some of them, you can start or develop the inspiring, imaginative and adventurous journey that I as a director and Theatre Lab as a company can offer! Please let me know if you are interested in this TLC Workshops Project, we need to know how many plan to participate in the workshops and showcase for planning and organisation.